2 registered members (Dorian, yellow20vt), 87 guests, and 2 spiders. I decided to change my brake hoses today as I was worried about the braided ones after IIRC Nigel had a problem . If anybody has braided hoses please check them as soon as you can. Last edited by PeteP; 23/01/2017 16:43.
i was told that goodridge had to up date there hoses for the coop as thay didnt have the rubber stopper things and the size was not quite right, i.e your pic , could happen, i wonder if you got a set of the old ones maybe? I also had the rubber rings .I bought my hoses about 18 months ago so I dont know if they are the old type or not. Gareth - keep the hose - get in touch with Goodridge (at Exeter) straight away - quote my name if you have to. You were lucky - mine were like that - right up to the point where I practiced an emergency stop at about 100mph - the hose burst, leaving me with the (useless) handbrake and the gearbox to bring it to a halt. 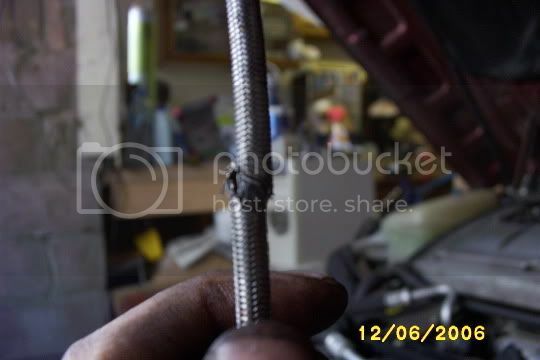 I've had some aeroquip braided brake hoses come of my car in an equally nasty state. 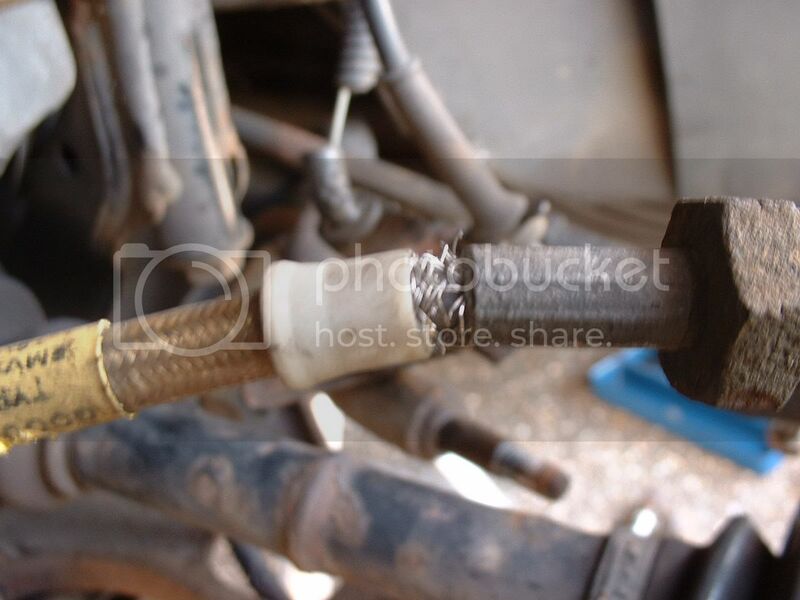 So for those of us with braided hoses (I was advised by Paul at Motormech to change mine), should we change to standard ones, or are there some braided hoses that don't break-down like this? not twisted , not binding and NOT RUBBING. Goodridge were not so proactive in offering to exchange my freying hoses ! Rog fitted some standard ones back on for me as I didn't have the time to chase it through . If I were Goodridge, I would be shipping out the new hoses as quickly as possible as this is a serious risk. If they were an OEM it would be a recall, no question. My driversside one is fine as it's short enough not to rub on the body, but my passenger side appears longer and has rubbed on the body and has frayed. No idea if they are Goodridge ones because they were fitted when I bought the car. The one pictured above is also from the passenger side. This is not a problem with fitting. It should be at least 40mm shorter IMO. I have the standard OEM ones on now. Running through some b-roads, a load of traffic had been held up behind a tractor , when the tractor finally pulled over, a lot were stuck behind an old people carrier. Immediately I change down and yank the handbreak up,.. this road is narrow and the rears suprisingly have locked up , maybe the handbreak does do something after all,.. plumes and plumes of tyre smoke from the rear of the car and the back of the car is fishtailing. Vx220 turbo stage 4 very fast! Blimey Joe thank god you're ok, that could have been very very nasty for you and others. Get that standard hoses on now ! Cerb 4.5 & Saxo VTR. 20VT and 20VT+ - gone but never forgotten. Which version of braided hose were you running? Cheers Guys, I was full of adrenaline and didnt feel frightened, but i know I had the strength of the Hulk when I pulled that handbrake up! Nigel, they were hoses from BigLads group buy several years ago, I don't know what make they were unfortunately. I'd had the missus and kids driving round in it at the weekend, glad they were'nt there. I'm fitting standard hoses on now, the braided ones only seemed to make a marginal difference for me anyhow. Ah well, at least Goodridge will be pleased to know its not just their hoses that are failing. Cr&p - glad you're OK Joe.... where did the hose go - in the middle due to fraying - or at the end where it joins the fitting? Goodridge wont deal with people at all now. I've not seen the hoses yet, or seen where it was leaking, I think the mechanic is on the case at the moment. As Goodridge have modified the disign then surely that means that a problem was known about. tbh it probably costs them a lot less to try to fend off litigation by individuals rather than try and do a recall system. Admitting any sort of liability is a financial worm hole for them. All it takes is for someone to be injured or killed because of these, and litigation is bound to happen, especially if the hose is found to have failed by the accident investigators. Scary stuff. Glad you got away with that one Doc. These braided hoses are just not worth the risk. Mind you, check your standard front hoses too. My MOT report says my 18-month old ones which have done less than 6,000 miles are 'slightly deteriorated'. Not a major cause for concern, but worth keeping an eye on them. Did you have goodridge ones Joe?? I'm not sure, they were from BigLads group buy 3 yrs ago, sorry. Maybe the new hoses would be fine, but I would only consider them if I had the wheels off regularly to check them to my satisfaction. If they are goodridge hoses they have a lifetime warranty and when i finally get them fitted to my coop if i do keep her, ill certainly hold them to it each and everytime they brake.. and wear and tear dont cut it with me, lifetime means everything considered as you cant wear the sods out of they are meant to last that long! Lifetime warranty usually means they are covered for manufacturing defects for the life of the item, not your lifetime. I'm sure they'll just claim they were fitted incorrectly or were past their usable lifespan. It's odd how one of the simplest parts on the Coupé has caused so many problems and nearly caused several serious accidents (a miracle they haven't yet IMO). I changed mine back to standard after Nigel's first post and didn't notice much difference. Rears are still on the Goodrich though, as there are no known issues for these yet. am still using the PRO-RS ones on my car. There's no need to take the wheels off - just turn to full lock and you can see them well enough. You can also see where they rub on the bodyshell. Suba is right - full lock then feel the hose with your fingers - you'll be able to feel any frayed bits - check the whole length from the union at the shock absorber, all the way to the inner wheelarch union. It's odd how one of the simplest parts on the Coupé has caused so many problems and nearly caused several serious accidents (a miracle they haven't yet IMO). You never know, may be it has happened just the poor driver would never had a chance to tell the world afterwards. Just a thought here what about sleeving the fronts with a bit of spliced rubber hose for that added pretection? I think i will be putting them on myself soon and it's a thinkg we used to do on the karts where we had similar problems with cables and hoses. Judging by other stories I got away with things quite lightly. One of my braided hoses on the front popped on Monday. Luckily it was on the rolling road during the mot. Spoke to Steve at Alternative Autos who supplied the hoses. He confirmed they have a lifetime guarantee and said to send them back to him for a refund. Does anyone know what is causing the hoses to fray? I fitted the ones from Big Lad to my coupe but remember that the gromit thingys didnt fit, I tried a few different things and in the end found that Mondeo ones fitted perfect. 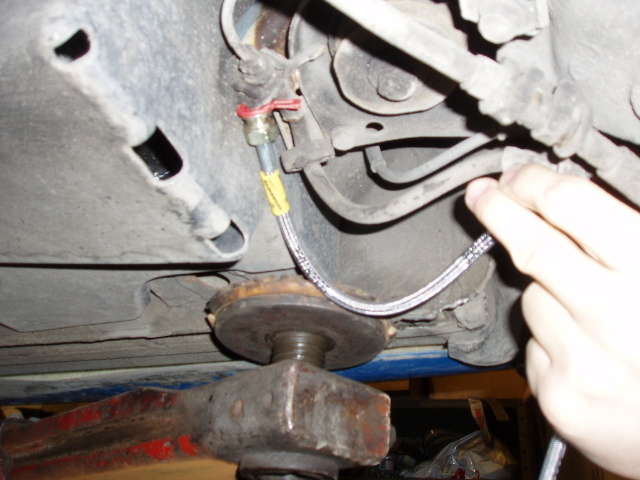 They either flex and break at the point where the hose meets the connector - or they rub at about the halfway point on the chassis and fray when you turn the steering wheel. By the way, what do non-braided (factory fitted) hoses look like? Lifetime of what, or whom, exactly? Just a thought here what about sleeving the fronts with a bit of spliced rubber hose for that added pretection? rubber donuts (held in the correct position with zipties). allow the fluid to drain dry. 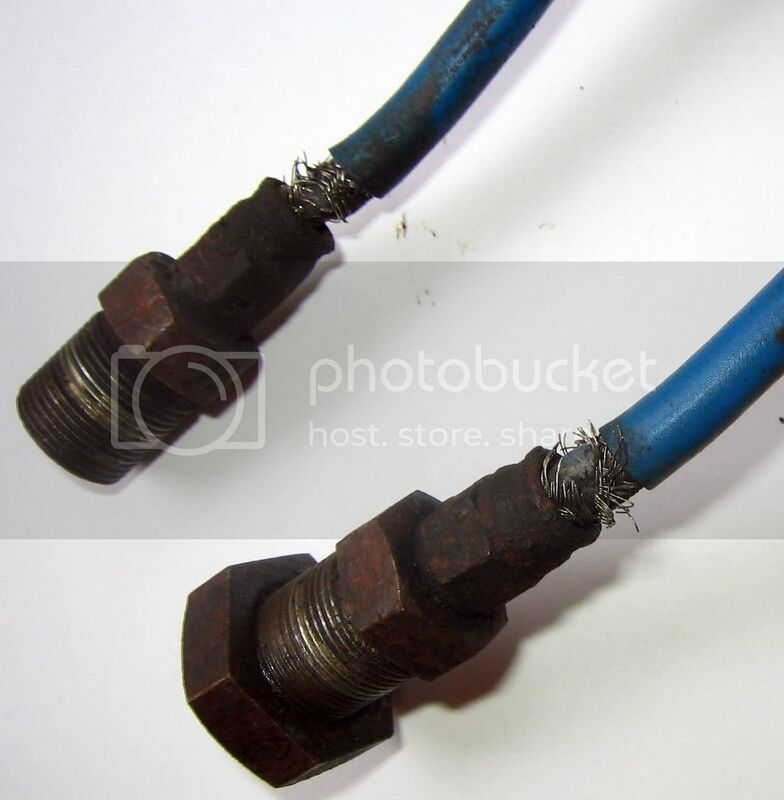 The whole reason we buy fiats is the uncertanty.We like the RAC and we like not knowing if the car will start again if we turn it off.If we wanted reliability we would buy a honda accord.But there boring,we like danger and fitting these hoses is just another step.Get them bought furry.. If you purchased them elsewhere, get in touch with the retailer NOW and sort it out. Its conceivable that lesser retailers may deny knowledge, or try to fob you off with a story that you should go direct to Goodridge. Don't put up with this - you have rights - exercise them. If you have no joy, report the retailer to Goodridge and they will be compelled to take action. There have now been several failures of 1st and 2nd generation Goodridge hoses - thankfully, none have led to personal injury, but a recent case has led to a driver having to use a kerb to stop his car. The 3rd generation hose (which I have on my car) appears to be OK - I check them regularly, as you might expect. Is it worth keeping even your updated ones on there Nigel? I'd have thought it'd be safer to return to standard hoses no matter how often you check them. 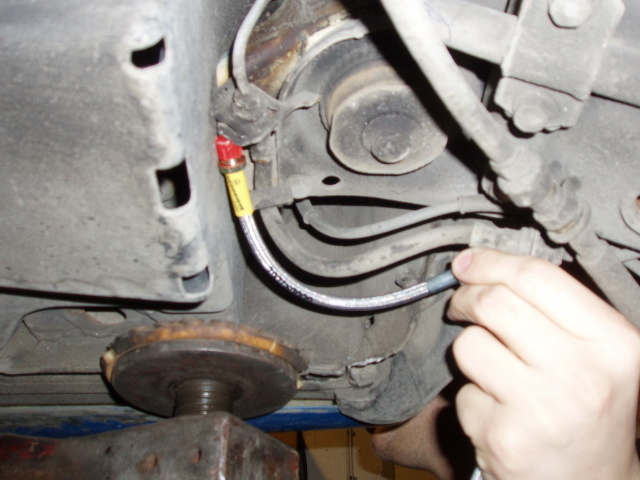 Has there ever been an incident of the standard OE hoses failing? Apparently, yes, but I can't say I've ever heard of it happening. I have a feeling that the failures of standard hoses are confined to internal collapses, rather than bursting or splitting, so the failure is far less spectacular or dangerous. Nigel - I got mine from demon tweeks as steve was out... they replaced them for an upgraded set already last year, presumably 3rd gen, will call them and check though. Are they simply supplying a 3rd gen set of hoses free? Thanks for the reminder Nigel . Steve sent me a note the other day, and I've been meaning to contact him to sort this out, but am just waiting to get my car back . Hopefully should be able to get some 3rd generation hoses sorted, before I have any major problems with my 1st/2nd . So what about the cost of taking off and fitting 3 sets of hoses now, directly down to their incompetence in making something fit for purpose? I reckon that must be approaching £200. Plus, I don't want braided at the rear and standard hoses at the front, it is not recommended so are they going to refund those as well, plus the fitting charge for replacements? Sounds like it's not just me having a rough time at the moment. I'll give Proven Products a ring a bit later and see what they say. I check my front hoses weekly, not yet found anything untoward, yet! E-mailed Steve last night, and apparently Goodridge are sending me replacements as I type . Let's hope his faith in them is justified . Just spoke to demon tweeks - they have no idea whether the replacements they sent me a while ago are 2nd or third Generation without me giving them the part number - lovely. I had an EGT sensor break and drop into my turbo. Demon Tweeks who supplied the sensor (that clearly had a design fault) said they wouldn't even give me a refund or exchange if I couldn't give them the broken off piece of the sensor that is probably lodged in my backbox at a guess. And of course they wouldn't pay for the labour to take my turbo off and inspect/pay for any potential damage. It may not be necessary to change the hoses. There is nothing fundamentally wrong with the version 2 hoses. As we know the problem is caused by the braiding rubbing against the plastic liner and fraying through to the inner pipe. James said that it depends on how they have been fitted and if any protection has been afforded them. For example, mine have been on for 18 months and show no signs of decay at all. They are checked for any abrasion on a regular basis. And just in case they do rub, they are also protected by a shot piece of tough rubber tube that is changed regularly. Well they never supplied doughnuts with them like the standard hoses did they so all i can say is that shows their design of the product for its intended use isnt strong enough. Last edited by bockers; 12/01/2009 11:32. After receiving my letter about the Goodridge 'recall' from Steve at AA I checked my hoses and ....wtf!!!! Lets hope these last a bit longer than the last set! PLEASE - everyone with braided hoses, check NOW! okay. will put up the car and check them today. One problem is i sent my whole pack back so im missing my rear bits So i left a message on steves mobile to let him know. My own fault really. though to be fair James from Goodridge never said to just send the fronts on their own. These ones also appear to be a bit thicker in diameter, have the doughnut bits on, a goodridge collar, and also some form of insulation over the braid as well, like some vacum formed plastic so that must help a little as well i imagine. If you buy a new set how can you tell that its 3rd gen? is it mentiond on the box? My driver side has been rubbing on the wheel arch liner and needs to be changed - they were already on the car when I bought it so guess I'll have to buy a new one. Where can I buy a replacement? I only need one side. The passenger side is fine/no contact. Just find out where they were bought from Zak as should know form previous owner... Or have warranty card for them i would think?? I'll check my folder of receipts for the car but I don't think I have this one. I'll have to contact JB. Received my new ones this morning, so decided to fit them before going on holiday tomorrow. Thought it might be helpful to post a couple of photos, so that people can see the difference between the old and the new ! You can see from the last photo that they have certainly improved the protection against rubbing. The ends also look to be sturdier than before, although only time will tell on this . You can also see that the new ones are a little shorter than the originals . They will crimp the ends properly once you've worked out the lengths and layout etc. Major savings and not difficult to do, and good people to work with. Mine have lasted for years without any problems. Oh and its JUST around the corner from my house always handy!!!! My car is leaking brake fluid and i top up about every 400kms...is this the case???? i'm planning a road trip next week...i suppose i must change these hoses right? 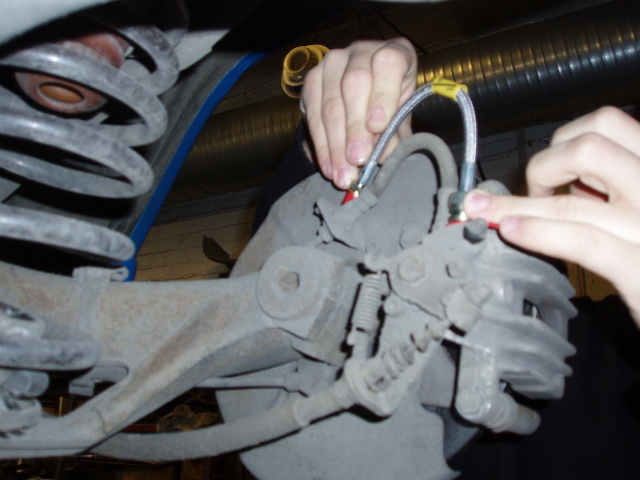 If the car's losing brake fluid the likeliest places are (a) the clutch cylinder and (b) the solid pipes across the rear subframe. *Any* loss of brake fluid should *always* be *immediately* investigated; slight leaks have a tendency to turn into big leaks; this can be terminally embarassing. this can be terminally embarassing. I have just ordered some braided hoses from RiceRocketuk (forum member and trades on ebay). Good price for the hoses at £56. Goodridge themselves wanted £90. I am assured these are the 3rd generation hoses but will check them carefully against the descriptions/photos kindly provided above and report back. Yes, I know you can't post in capitals but I want people to read this !! And if the mods notice it, so much the better. I phoned Alternative Autos the other day trying to get a set of 3rd Generation (i.e the "safe", "uprated") Goodridges for the Coupe. They told me that these have been withdrawn from sale to the public as they were too dangerous. This also bears out my searches on other sites, saying that they are not available, etc. Now we all know about the problems with the 1st and 2nd revisions of these hoses, but quite frankly, if they can't be made to work 3rd time round, why are people still bothering with them ? How can any benefit outweigh the risk ? I know some people have them fitted (and properly) and have no problems, but again I thought this should be brought to everyone's attention. It's been a while since I posted on here, but I bought some of the original Goodridge hoses. Luckily it was at the MOT station, but it still ruined my day, and bumper a sthe car was dragged onto a flatbed to get it home. Very pissed of with the whole episode though. Have good ridge at least replaced the hoses for you by now?? I currently have the gen 1 version on my coupe. I have retro fitted some rubber sheaths with cable ties and I regularly check the pipes, but I would like to change them at the next service. The pipes were already fitted to the car and I don't have the receipt, so I guess I will have to replace myself. Would the gen 3 be worth it, or would it be easier to go back to OEM's? I'd go back to standard hoses. If it's clear they are goodridge hoses then why would you need a receipt? Have you spoken to them directly? No, I'll try that thanks. I was wondering if they would offer a replacent and would it be worth taking? You think going back to standards would be best then, that's a shame cos I 'm well happy with my breaks at the mo. Pagid blues, brembo drilled disks etc. I have the Gen 3 hoses on my car - free from Goodridge. I keep a VERY close eye on them though! 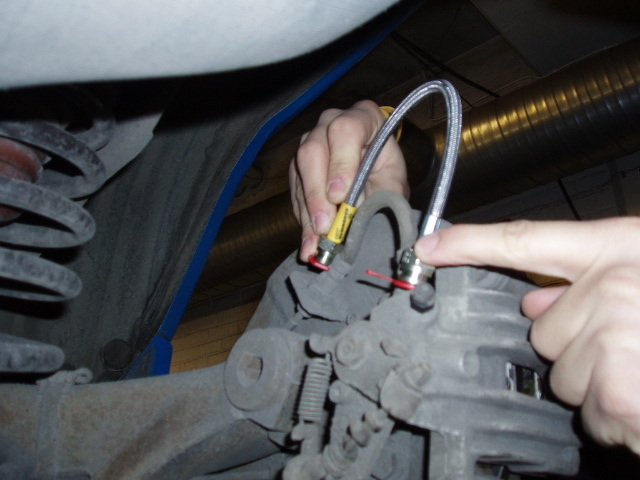 Braded hoses (like standard rubber ones) should run without any twisting, unfortunately they do not have the markers painted on them like rubber. They can sometimes also have a natural set (lay) due to the weave of the steel, this should also be taken into account. On motorbikes you can get plastic spiral wrap to protect the paint work (and braiding from fraying). Maybe this will help. Sorry to drag this up again but I need some advice. After a few weeks of trying, ie leaving messages etc, I managed to speak to Goodrich about this. I told them the date of purchase and product code and they confirmed I had a set which had been recalled. Unfortuantley I was not the one that bought them, the previous owner did. Anyway Goodrich told me that I was outside the period to get a replacement set. WTF!! I asked if they had a lifetime gaurantee, which they do. I then asked if they were fit for purpose, if they had been recalled, which they are not, so why won't they replace them? They suggested incorrect fitting, but I said that they are fine at the moment so if they could send me a letter confirming they were fit for purpose I could then get the garage who fitted them to replace them. obviously they wouldnt do that. Were do I stand as I wasn't the original purchaser? They asked me to send them in so they can examine them, but I felt like I was being fobbed off. Who was the original purchaser? A previous forum user got them from BGC motorsport, who then ordered them from goodrich - who sent them direct to the forum user. How can something be out of time for a safety recall? Any of you guys hade a problem with too long hoses for the rear breaks? http://www.orle.se/projekt/goodridge/1.jpg -> The shortest one. This is the one for the calliper. http://www.orle.se/projekt/goodridge/2.jpg -> The tallest one. Had a problem with my brakes recently with the pedal being VERY spongy. Took it to a local garage where they changed fluid, checked discs, pads etc....but couldnt find a problem. Still the problem remained, so on my last service i got Paul at motormech to have a quick look, and guess what?..... braided hoses that had split. Got it booked in to have them changed back to standard. I have still been driving around cause brakes havnt been too bad, but about 30 mins ago, a car slammed on his brakes in front of me, i slam on the brakes, and the f**kin pedal goes right to the floor but the cars got no intention of stopping! Thank god there was nothing on the other side of the road cause i had to swerve to avoid the car infront. VERY SCARY guys....i cant recommend it enough! Get your hoses checked. It's wierd how obsessed we get with making these cars go faster, but rarely think about how we are gonna make the bloody things stop again! LOL. Last edited by otis_b; 31/03/2007 01:54.
exactly the reason why I removed my front braided hoses, they were well worn out after 2 years, even though I had fitted the donuts, the stainless had actually fatigued by flexing & cracking. I've kept the rear ones on as they just don't suffer the horrendous duty at the fronts, but since i've upgraded the calipers & fitted new OEM hoses at the front, the pedal response is perfect. mine failed the mot 2 weeks ago on braided pipes. burst on way back to garage to get them changed!! My hose burst at 130mph , It was luck more than anything else that myself or anyone else wasnt killed. I had only checked them 2 weeks ago when the car was MOT'd all looked absolutely fine. A visual inspection is not enough imo. Just had one of mine burst during an MOT, checked them last week when I changed my pads. No sign of fraying or anything, but burst in the middle of the pipe. how long have they been on the car? Thankfully, they burst on the rollers at the MOT garage - the MOT chap was mortified, but Iceberg wasn't at all surprised and went round with a set of OE Fiat hoses. This failure was the same as the type 2 hose - it fractured right next to the union on the suspension strut - clearly its the repeated flexing (and the angle of the flexing) that has caused the failure. Goodridge have been out to see the car and what's left of the hose. They're re-designed the standard hose AND they've made a "type 5" hose that replaces the solid piupe from the caliper to the strut - its now using a flexi pipe all the way from the caliper to the flitch, going through a flexible mount on the strut. Most importantly, it uses a 90 degree angle union coming out of the caliper, so the hose isn't pulled hard when on lock or suspension movement. So, yet again, please, PLEASE will anyone running braided hoses (any make, not just Goodridge) check them, or have them checked STRAIGHT AWAY. Its only through some immense good fortune and a modicum of driving skill that we haven't had a fatality. I just bought a 20v turbo and it has braided hoses on it already. the brakes feel very spongy so i am going to check the hoses!!! What exactly am i looking for and if they are fraid can i phone goodridge direct and ask for a set of 3rd gen ones and they will know what i mean?? I got a mechanic friend of mine to check my nearside wheel today because I could hear a knocking noise. He couldn't find what the noise is..but he did inform me of a hose in very bad condition, looks like the ones in the pictures. Its a sobering thought to think that it could have gone at any moment. I'm gonna get it sorted ASAP. I read this thread months ago and didn't have the wits about me to go outside and check. May this be a lesson to me. It would appear that Goodridge's 5th version is working. Do you know if AA's are suppling sets again Nigel? where can i buy these new 5th gen goodridge hoses? That was exactly what I would have done designing them in the first place. They fatigue at the joint. There is no way in hell I would ever use goodridge again (5 tries to get it right!?!??!?!??! ). In fact I went back to rubber hoses after goodridge gen 3 hoses were not up to the job. Are they exchanging them F.O.C? I dont know Nigel - but the Aeroquip hoses that I have had made for me look nothing like the goodridge ones. I can take a picture and send to you if you like.... I can get them made for £10 a hose - so £50-60 for an entire set as a one off kit. any chance of a photo of a goodridge failing hose and a gen5 or suba custom job then please?